Landlords in North Carolina have a statutory obligation to keep leased properties up to code and in a fit and habitable condition. When they fail to do so and mold growth occurs as a result, the tenant may be physically and financially damaged. If the tenant had previously provided the landlord notice of the problem, or the landlord in fact knew through its own inspection, the tenant may be able to pursue an action for rental abatement and property damage caused by the mold. The Raleigh toxic mold attorneys of Maginnis Law assist tenants by attempting to negotiate a settlement agreement with landlords and, if necessary, filing suit for recovery of appropriate damages. To speak with one of Raleigh mold lawyers, call 919.480.8526 or send a confidential email using our contact page. Many varieties of molds can grow in residential properties; a few of the more dangerous molds are aspergillus, stachybotrys, and chaetomium. These molds are known to cause health problems including skin irritation and respiratory difficulty. If you, or someone in your household, has experienced health difficulties due to exposure to toxic mold, it is certainly reasonable to argue that the property was uninhabitable and you are, therefore, entitled to a recovery of a portion of the rent paid for the premises. This is done through an action for “rental abatement.” The amount of abatement is calculated as the difference between the value of the property had it been as warranted (i.e. fit and habitable) and its actual value during your period of tenancy. You are permitted to recover no more than what was actually paid. 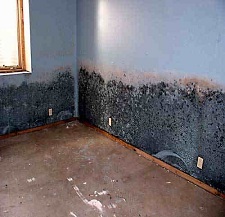 Mold can also cause damage to your physical property. Many of our clients have had extensive mold growth on upholstered furniture, clothes, musical instruments, desks, etc. Black mold experts generally recommend not taking these products to a new residence as they can transport dangerous mold spores. If you are forced to throw them out, your landlord is responsible for compensating you for their value. They are also liable for the cost to remediate any property you do keep. The evidentiary standard required to recover rental abatement and property damage due to mold was discussed in the recent North Carolina Court of Appeals case McCall v. Norman. There, the Court allowed recovery of over $10,000.00 in damages without the tenants tendering a true expert in mold growth. The tenants offered their own testimony as to respiratory difficulty and property damage, photographs of the mold, and the testimony of a building inspector that discussed the water damage that caused the mold growth. The Court held this was sufficient to establish a prima facie case and the tenant did not need to offer a mold specialist or doctor. This was an important victory for tenants as the cost of such experts can make litigating a case very risky. Maginnis Law regularly represents tenants in disputes with landlords. We can handle these cases under multiple billing arrangements, including contingency. All consultations with the firm’s Raleigh toxic mold attorneys are offered free of charge. To discuss your mold case, call the firm at 919.480.8526 or send an email using our contact page. The Raleigh law firm of Maginnis Law regularly represents clients in and around the Triangle area, including Raleigh, Durham, Chapel Hill, Cary, Apex, Garner, Wake Forest, Fayetteville, and Greensboro.